Damn Yankees - if you love dance, you must go see this production at Utah Cultural Celebration Center in West Valley City. By far some of the best community theater choreography I have ever seen is on this stage. Leah Hasset as Lola will have all of the young girls wanting to learn to dance and all of us older girls wanting to go back to dance. She gives Gwen Verdon, original Broadway star, a run (or dance?) for her money. Now that I have that out of the way, let me tell you about the Utah Cultural Celebration Center. This is probably the best venue you have never been to. I did not know it existed, neither did my friend whose condo you can literally see from the amphitheater. The backdrop is the Wasatch mountain range, the ceiling is the setting sun transforming into the twinkling of the stars, all while being surrounded with a pristinely new arts facility. In fact, I'd recommend arriving a few minutes early to explore all this venue has to offer. Keep your eyes open for free events throughout the summer. The volunteer ushers, box office workers, and cast were the tops in politeness and customer service - including passing out candy to audience members as we departed. 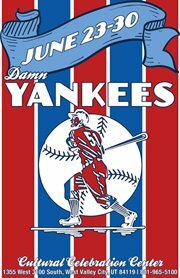 So what is Damn Yankees about? The storyline of Damn Yankees does no favors to the remarkable cast and talent on any stage and will most assuredly be the weakest point of most productions. If you want a full assessment (aka the cold, hard truth) from a former cast member, read here. This is your typical "sell your soul to the devil so your baseball team can win" story. Basically, Joe Boyd (Brandon Rufener) ignores his wife, Meg (Brittany Carroll), six months out of every year for the love of the baseball game. He offhandedly remarks that he would do anything for his beloved Senators to win the pennant. Cue the entrance of the devil (Johnny Hebda) willing to barter Joe's soul for a chance to help the Senators win. Joe agrees, plays for the team as young Joe Hardy (Austin Smith) whilst battling off skeptical reporter Gloria Thorpe (Megan Winegar) and the advances of the devil's temptress Lola (Leah Hassett!). Meanwhile, Meg is at home, entertained with her crazy friends Sister (Jessica McCowin) and Doris (Carla Kirk). Will the devil win Joe's soul? Or will Joe's true love for Meg conquer all? Meg Boyd is the one casting decision that confused me, but not for lack of talent. She looked a good ten - fifteen years younger than her romantic counterpart and I sensed a much greater chemistry between her and young Joe Hardy than with her husband. I heard several similar comments amongst audience members. In spite of this, Brittany Carroll does a fine job - her voice is very reminiscent of the sweet, classic sounds of the 1940s, she played her character with utmost tenderness, and she oozed class and compassion. Both Joe Boyd (old Joe) and Joe Hardy (young joe) have crystal clear voices. The transformation scene made me giggle because young Joe emerged in old Joe's huge shirt, but his pants were skin-tight - I'd have expected the pants to be loose as well. Now that Applegate (the devil) has made Joe into a prodigy of a ballplayer, enter the Washington Senators and their see-through pants. More giggles. The sad thing is that their pants were much less see-through (you see their striped shirts tucked in through their pants -nothing even near vulgar, just funny) than in the production I was a part of. You stop noticing after about the first couple minutes, especially when distracted with their goofball antics and pleasing harmonizing of the quartet on "Heart." Even with the crazy plot, Damn Yankees has a special place in my heart because I was privileged enough to perform the role of reporter Gloria Thorpe for six weeks a few years ago. I was pleasantly surprised with the performance of Megan Winegar. She gave Gloria a flair of Dottie Henson (bold, yet ladylike), Gina Davis' character in A League of Their Own, especially when she grabbed a baseball mitt to join in the rousing celebration with the boys in "Shoeless Joe." Ever want to see ball players frolic and dance? Here's your chance - and it is amusingly delightful, truth be told. Back to Winegar - she has everything she needs - vocal chops, dance skills, and unwavering conviction...nothing about her character makes you question her credibility in any way. I forgot to mention the comic relief characters of Sister and Doris - Jessica McCowin and Carla Kirk. Sister is off-the-wall bonkers, unrelentingly flirtatious, and an absolute treasure to the show. She'll make you laugh for sure. Doris is her straight-man and adorable in her own right. Now to my favorite, whom I've already mentioned - Leah Hasset as Lola. Folks, you won't find a treasure like her on many community theater stages. If your little girls love dancing, please take them to watch her and show them what they can become. Lola is mainly a dancing role, in my opinion, although she has several songs, which Hasset is more than vocally adequate performing - not even running out of breath as she twists, spins, and contorts her body into positions only yoga-enthusiasts know. Her facial expressions will amuse you, along with her acting, first as a temptress in employ of the devil, then as a lonely young woman rooting for Joe and his love for Meg - very tender. Hasset alone is worth your $5 to go see - I promise. Based on my research, she only graduated from high school last year - definitely keep your eyes on this one. With all this mention of the devil Applegate, I have yet to address Johnny Hebda's performance. He's got the young, attractive, charismatic appeal that you would want from a schmoozing salesman. I have a hard time seeing past the inherent flaws written into the script for this character - he seems too weak to be the Lord of Darkness, but Hebda performs the role with pinache. I wanted a little more gusto, or umph as some people call it, on the big notes at the end of, "Those Were the Good Ole Days," but that is just a personal preference - Hebda has a technically correct and crisp voice to carry off his number with ease. As I mentioned before, if you love dancing, you need to see this show. Choreographer Michael Hernandez has won me completely. I think I'm in love. Okay, not really, but you get the point. He's on tour with Disney right now, rumor has it, if that tells you anything. Every cast member could dance their tails off - some quite unexpectedly. During, "Whose Got the Pain," featured dancer Corbin Schmidt - wow - you will not see a man move this way on any other community stage and I was entirely shocked. Other ensemble members are dressed in rather unfitted dresses, giving you the impression they perhaps wouldn't be dancers, and then - bam - high kicks, splits, pirouettes, leaps, you name it. Each director tries to add their own flair to the show - adding "finishing touches" here and there, cutting music to be longer or shorter, making duets chorale numbers, etc. Director Julie Waite began this production with the singing of the National Anthem - very beautifully done. During the benefit show portion just prior to intermission, the cast members came out to the audience to watch, as they naturally would for a benefit. I typically hate audience mingling, but this was done just right and added to the atmosphere. So, the all-important question: Should you see the show? If you are a lover of dance, yes, Yes, YES! If you are someone who is easily distracted by a weak, slow storyline, then this may not be for you, again, not through any fault of the performers. I assure you, every character on stage is strong and skilled in the triple-threat arena of music dance theater. This is well worth your $5 for an entertaining, unique experience under the stars with West Valley Utah Cultural Celebration Center and the cast of Damn Yankees. The show runs at 8pm and closes on Saturday night June 30th at 1355 West 3100 South, West Valley City, UT 84119. Admission cost is $5. Only three chances left - don't strike out on this one! Grab your baseball mitt and go have a ball! Video of "Whose Got the Pain?" here. Great post! Personally, I'm really impressed! I love the way you write your blog!